Are you excited about visiting Art Central this year? Are you having trouble finding friends or people to accompany you during this hectic period? 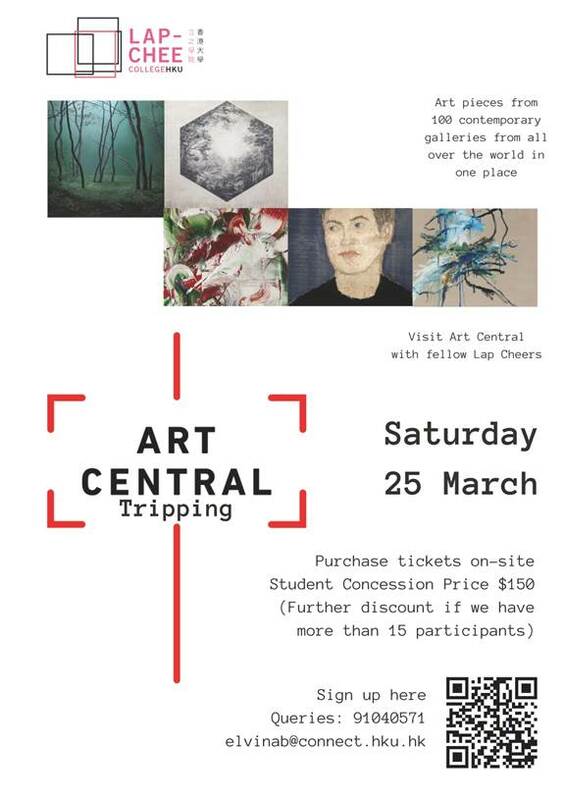 Come join Art Central Tripping with ART-ivity and get the ticket at a cheaper price! We will gather at the lobby on Saturday and visit Art Central together. Tickets will be purchased on-site on the day itself. However, we may need to pre-order to get the group discount if we manage to get more than 15 participants. Time: Depending on your availability and preference, which you can indicate in the google form! A heaven for every Art Lover, Art Central is a rare opportunity where you can see and enjoy masterpieces from 100 galleries all over the world (New York, London, Taipei, Seoul) in one place. This year is the third edition of Art Central and in addition to pieces from well known artists, you would be able to see showcases from the next generation artists. Check out their websites to see the list of art galleries http://artcentralhongkong.com/galleries/ and also their Instagram account for pictures from the event last year https://www.instagram.com/artcentralhk/.